Here are the basic guidelines to follow. Single-initial monograms can be a person's first or last initial. This is completely your preference. When placing order, be sure to state you would like, "single-initial monogram." This format is as follows: first name initial, last name initial, and middle initial. The last name initial, in the middle, is bigger than the two side initials. When placing order, be sure to state you would like,"traditional 3-letter monogram," to ensure proper initial placement. 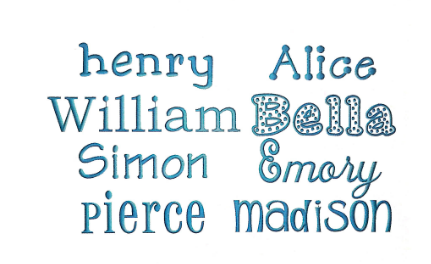 When the monogram format uses the same size letters for all initials, the format is as follows: first name initial, middle name initial, last name initial. When placing order, be sure to state you would like, "uniform 3-letter monogram," to ensure proper initial placement. Since we are in the south, we like to follow the "ladies first," policy. This would give you a format as follows: bride's first name initial, married last name initial, groom's first name initial. We acknowledge that not every couple does things "traditionally," these days. Feel free to contact us if your couple does not fall into the "traditional" category. When placing order, be sure to state you would like, "traditional married couple monogram," to ensure proper initial placement. These are our favorite & most popular monograms. And if these don't suit your fancy, come on in the store and check out our books filled with hundreds more!